Heat transfer correlations are required for both system analysis and sub-channel analysis. To achieve reliable heat transfer correlations for ADS applications, a thorough review and assessment of available experimental and theoretical works in the literature is performed. Figure 1 shows the Nusselt number in rod bundle geometries according to various correlations. In the case with a constant turbulent Prandtl number (Prt = 1.0), all correlations proposed for rod bundles show a good agreement. 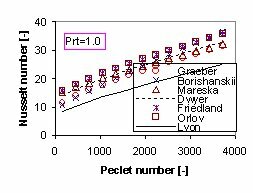 However, the correlation of Lyon, which is developed for circular tubes, clearly under-predicts the heat transfer in rod bundles. Therefore, correlations developed for circular tubes can not be directly applied to rod bundle geometries. CFD analysis is carried out, to provide basic knowledge of HLM heat transfer and to figure out the effect of various parameters on HLM heat transfer. 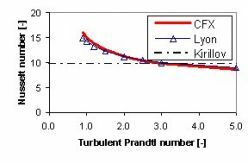 Based on the results achieved, new correlations can be proposed for both heat transfer and turbulent Prandtl number in LBE flows. Figures 2 & 3 show the effect of turbulent Prandtl number on Nusselt number in circular tubes and in rod bundles, respectively. A decrease in Nusselt number is clearly seen with increasing turbulent Prandtl number. There is a good agreement between the CFX results and the Lyon model. For the flow condition considered in figure 2 (Pe=1200), the model of Kirillov agrees well with both the CFX data and the Lyon model with a turbulent Prandtl number of about 3.0. 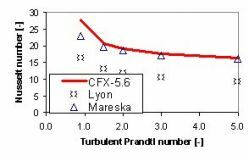 In rod bundles, an excellent agreement is observed between the CFX results and the Mareska’s correlation over a wide range of turbulent Prandtl number. The correlation of Lyon for circular tubes strongly under-predicts the heat transfer in rod bundles. X. Cheng, H.Y. Chen, N.I. Tak, Turbulent heat transfer to heavy liquid metal in rod bundles, NURETH-11, Popes Palace Conference Center, Avignon, France, October 2-6, 2005.